Your clients invest in the health of their animals. Isn’t it time you did the same, with a product that can help you deliver the best care possible? 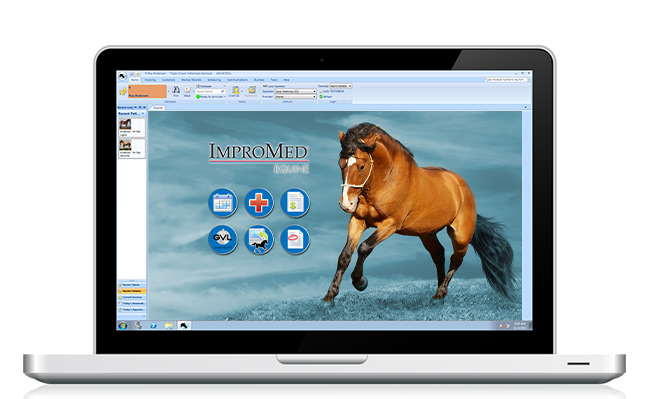 ImproMed Equine is the best-selling equine practice management software, designed specifically for equine veterinarians. ImproMed Equine operates easily in an ambulatory or hospital setting. Mobile versions of the software are available for offline access on laptops or tablets. Syncs occur quickly and easily upon return to the office, when you are back in network. Easily invoice multiple patients assigned to a Stable or a Trainer at once. You can even use Split Billing to make sure the appropriate parties are billed correctly. With ImproMed Equine, you can store and transfer inventory between multiple locations, automate mark-ups, and track inventory trends from one location, so you can grow sales while keeping your profit margin in line. Specifically designed for equine patients to quickly “check the boxes” to administer treatments, which updates the medical record and places appropriate charges on the client invoice. This saves time and eliminates missed charges. Enter data once and your information instantly populates throughout the entire system. Within a matter of seconds, every networked computer will show the same information. We put ImproMed techonology at your finger tips with a product line that gives you information on the go. All applications work with iOS or Android devices. ImproView allows you to look up medical records, account balances, or access client contact information. Pulse allows you to monitor your businesses' profitability in an easy to use app, you can search revenue, payments, transactions and accounts receivable to get a financial snapshot of your practice on the go. Improve patient care with the Lab Retriever app, easily access lab results anytime, anywhere. Streamlined with an enhanced look and feel for easier use. The new Whiteboard view allows you to see all patients in the practice at once. ImproMed Equine practice management software offers more vendor partner integrations that any other equine software on the market. Connect with vendor partners of your choice for in-house and reference labs, digital imaging, and pharmacy references. Equine practitioners travel from office to farm to stable—there’s no extra time in the day to transcribe paperwork and track down inventory. ImproMed Equine Practice Management Software gives you all the tools you need to streamline your practice and keep medical information at your fingertips. Mobile apps, automated ordering, tools to analyze your pricing, complete treatment plans and so much more are in one easy-to-use system. Let our customers tell you how ImproMed Equine puts them in the winner’s circle.